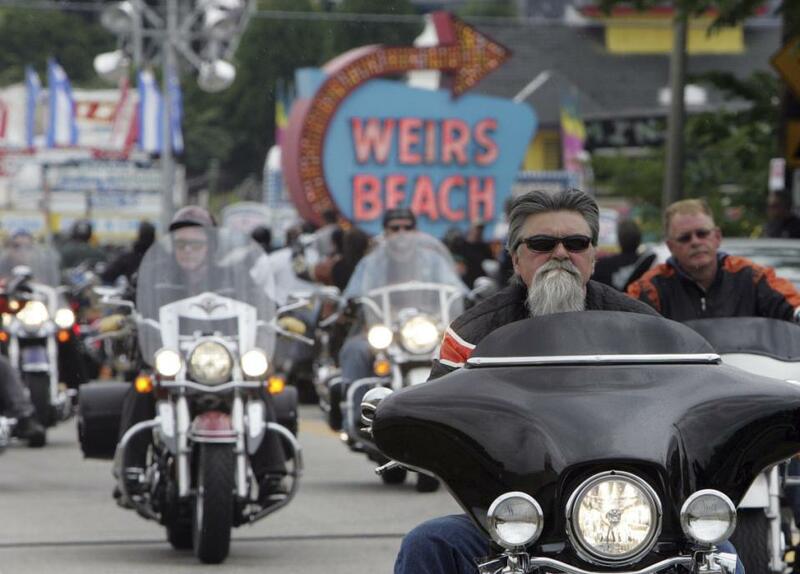 Bikers arrive at Weirs Beach for bike week in Laconia, N.H.
Police officers and outlaw biker gangs often stand on common ground. Both attract the young and adventurous who value order, discipline and brotherhood. And on weekends tens of thousands of cops routinely trade their cruisers and badges for choppers and club colors. The bond doesn’t mean a free pass for criminal motorcycle gangs, but even some within law enforcement worry that too many officers believe bikers are just misunderstood Robin Hoods. And empathy from officers who emulate or even aspire to the outlaw life can put police or the public at risk, gang experts warn. The relationship between police and criminal biker gangs — dubbed Outlaw Motorcycle Gangs or 1 percenters because they are said to represent the fraction of motorcycle enthusiasts who operate outside the law — came into focus following the May 17 shootout involving rival gang members, including a retired San Antonio police officer, that left nine people dead in Waco, Texas. Police on hand at the meeting fired at least some of the shots once violence erupted, but a photo showing some of the dozens the arrested bikers sitting calmly on curbs using cellphones under seemingly nonchalant police guard earned the ire of critics. Some wondered if police went easy on the bikers. A 2014 ATF report said biker gangs count working police officers, firefighters and 911 workers as members. The report details a California Highway Patrol dispatcher listening to the scanner and tipping off her husband, a Hells Angel prospect, that the police were headed to a fight he was involved in. The husband took off before the cops arrived. In another instance, the dispatcher ran a license plate for undercover agents working on a weapons sting against her husband. In New York City, Detective Wojciech Braszczok is on trial, charged with joining a mass of angry motorcyclists — though not a gang — who assaulted an SUV driver during a wild highway chase in 2013. Braszczok said he didn’t intervene because he thought it could compromise his unrelated undercover work. The gulf between outlaw biker gang and motorcycle club is vast, and the great majority of the law enforcement or veterans clubs perform community services year round, like delivering toys at Christmas or the Patriot Guard Riders, who provide a rumbling motorcade — and a buffer against protesters — at the funerals of fallen soldiers. Still, Laconia police Chief Chris Adams, whose New Hampshire town will attract hundreds of thousands of bikers to its annual Motorcycle Week starting on June 13, said he has seen some officers instantly transform when they’re wearing club colors instead of their uniform. Adams said his department maintains a “working relationship” with the region’s dominant motorcycle gang, the Hells Angels, to address problems big and small. Look around during Laconia’s Bike Week — or at any of the other big rallies like in Sturgis, South Dakota, or Daytona, Florida — and you will see the colors of law-abiding motorcycle clubs made up of police, firefighters and veterans. The Blue Knights, among the most recognized law enforcement clubs, has almost 20,000 members in 640 chapters in 26 countries, but there are others sprinkled all over the country. The Blue Knights International, based in Bangor, Maine, did not return a call and email seeking comment. Steve Cook, who leads the Midwest Outlaw Motorcycle Gang Investigators Association, says some of the legit clubs go to “totally embarrassing” lengths to ingratiate themselves to criminal gangs. But the very existence of law enforcement clubs can stoke violence, Fuller said. In 2008, Seattle police Officer Ronald Smith was charged with felonies after shooting a Hells Angels member during a bar fight. Smith belonged to the Iron Pigs motorcycle club, made up of police and firefighters. The charges were later dropped. And in 2012, two officers who belonged to a law enforcement motorcycle club were involved in a bar fight with bikers in Prescott, Arizona. Jay Dobyns, a former undercover agent who infiltrated the Hells Angels for the ATF, worries that chumminess between biker gangs and the more benign law enforcement motorcycle clubs can lead to a perception that cops will go easy on the outlaws. When Dobyns was undercover, he said, cops from motorcycle clubs would try to cozy up to the outlaw bikers. “I’m talking about the clean-cut law enforcement officers who wear a uniform and ride around in marked cruisers every day; then Saturday comes around and they put on a black bandanna and black T-shirt and scowl at everybody,” he said. The gang members were having none of it. They both use intimidation, threats of violence, and actual violence to get their way. They both protect their comrades behind a wall of silence.